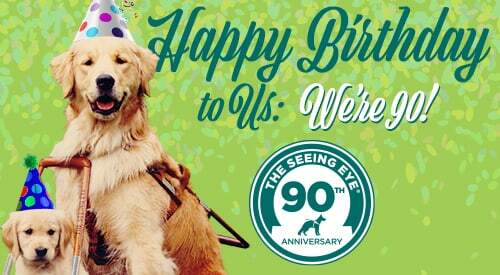 The Seeing Eye - Happy 90th Birthday! Mickey here. I am reporting to you today from our 90th Birthday Celebration! Ninety years is quite a milestone for any company, especially a non-profit organization. So to help mark the occasion, The Seeing Eye was invited to ring Nasdaq’s closing bell in Times Square in New York City yesterday afternoon! Help kick off our 90th Birthday Celebration by watching our President and CEO Jim Kutsch ring the Nasdaq bell! Standing on that famous Nasdaq trading floor and thinking back to our beginnings on January 29, 1929 is pretty paw-inspiring! Lots of new training challenges have come our way since then that our founders could have never imagined! In modern times, we dogs are trained to deal with new forms of transportation, quiet electric cars, and incredibly distracted pedestrians walking while looking at their cell phones. Our founders could have also never dreamed of all the cool, new assistive technology -- from phone apps and talking crosswalks to screen readers and voice-activated digital assistants. Yet, they would absolutely still recognize the value and mission of our organization, which is unchanged since the beginning. We still commit ourselves every day to increasing the independence, mobility, and self-confidence of people who are blind through the use of Seeing Eye ® dogs. You’ve made all this possible, human beans! Thank you! But enough from me, take a listen to what our CEO Jim Kutsch has to say!